The 1966 collection we have had numerous occasions to talk about here at Watches of class, even in the most complicated versions ; Girard-Perregaux 1966 Annual Calendar minutes Repeat Equation of Time is a new performance luxury watchmaking of the highest levels of manufacturing of La Chaux- de-Fonds. In the 42 mm case – considered by Maison “XL” – are not only space more than 400 mechanical components that give birth to three beautiful complications, but also the acoustics ideal for fine-tuning of the minute repeater. A loud, two astronomical. Minute repeater, annual calendar and equation of time is a rare combination and very complicated. 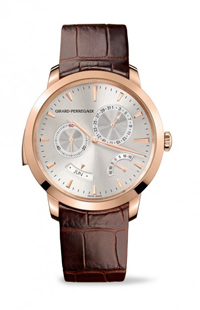 You can not define a Grande Complication because according to tradition the second should be a perpetual calendar – perhaps with phases of the moon, and the third an additional function of time, as a chronograph – maybe split second – or a tourbillon, but given the numerous precedents which Girard-Perregaux has accustomed us in his long career, and the mere presence of complication that reads the difference in minutes between the time average conventional and solar power, looks more like a simple choice. Acting on the slide in the opposite direction to the winding crown is activated repetition which allows you to listen to the finishing touches of hours, quarters and minutes. Always the finer points of this function are the acoustics and noise of the mechanism. The watchmakers Girard-Perregaux, which driving for a year is the legendary Dominique Loiseau, have optimized the internal diameter of the chest to get a crystal resonance. In particular, the presence of a base Galbe increases the volume of air between the movement and the casing thus improving the propagation of sound, the lower part of the bottom has been diamond to reduce – if not to eliminate entirely – the acoustic interference. The calendar that requires a single correction year in February on the dial shows the two types of date indication and months of one versus the other, the first is marked by a hand in a subdial between one and two, the second in a window arquata at seven o’clock. At half past four hours is the equation of time, namely the real time display – called solar time – compared with the calendar year in which every day of the year always lasts 24 hours. In fact, the length of the day varies on a daily basis, and if the two time differences correspond to four times a year, the cumulative difference can wait 16 minutes for example, in the month of November. E ‘marked on the dial in an area between four o’clock and five. 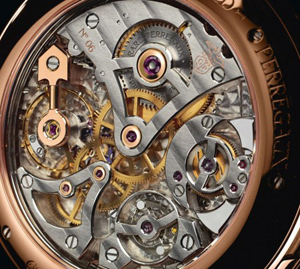 Of course, even in 1966 Repetition minutes Annual Calendar Equation of Time, Girard Perregaux could not forget certain to leave his seal: the caliber hand-wound mechanical watch which perpetuates the great tradition of the Maison has engraved on the balance bridge the famous Three Bridges d ‘gold. The case is made of rose gold with a polished finish, the bezel finish. Size 42 mm. The dial, as well as being made more important by the astronomical indications stands for a fine processing to “soleil argente”. We Olympus mechanical Swiss watch. Details such as the wrap-around shape of the handles, the court of good size to wrap the wrist, applied faceted indexes in gold, but also a complicated mechanics and compact on the basis of more than four hundred tiny details, say it all. As it has done on other timepieces in the 1966 collection, created to commemorate the triumphs of Maison events to mark this year at the “Concours de Chronometrie, maybe in the future is already a version with an additional” extension “of complications on board, time, however, the 1966 is more complicated than it is and will be built in only 15 copies, you probably already sold at least in part. La Maison opened in 2013 to great and no longer as in the past according to the SIHH where questianno to no longer participate. There being no other exhibition-events until April, Girard-Perregaux 1966 Annual Calendar Equation Repeat minutes of time is in effect a preview Baselworld 2013.